On Thursday, 21 June 2018, the BBC World Service officially transmitted the 2018 BBC Antarctic Midwinter Broadcast–an international radio broadcast intended for a small group of scientists, technicians, and support staff who work for the British Antarctic Survey. This is one of my favorite annual broadcasts, and I endeavor to listen every year. Once again, the SWLing Post called upon readers to make a short recording of the broadcast from their locale. Below are the entries, roughly organized by continent and country/region. We had a total of 28 recordings submitted this year–simply amazing! If I’ve somehow missed including your entry, please contact me; I’ll amend this post. Preperations with my 6y old son – highly professional with clip board, frequency setting on equipment, adjusting the antenna tuner. setting the alarm clock and preparing cups for warm drinks. Wonderful broadcast with heaps of feelings and good music – I reckon the crew in Antarctica enjoyed it. I used to listen with my dad to Norddeich Radio – also broadcast for crews and sailors out on sea. Full reception of the 2018 BBC Antarctic Midwinter Broadcast on my little YT-Channel. Received with a AFEDRI SDR with HDSDR and a Wellbrook ALA1530LN. Nice signal on all frequencies at my QTH (JO40BT) in Germany. Notes: Hi Thomas, like every year attached I send you the youtube link of the broadcast BBC MIDWINTER 2018 with the hope of seeing it published also this year on swling. Receiver is an SDRplay RSP2 and Antenna a Wellbrook ALA 1530. I use my Hallicrafters SX 42, Siemens E 401, Collins HF 2050 and Teletron TE 712S receivers with a magnetic loop antenna. I’m Giuseppe Morlè, iz0gzw, from Formia, central Italy, on the Tyrrhenian Sea. I send you 2 videos about the Antartic Midwinter 2018 to be included on the Swling Post. You can see how you listened to from my house on my 3 receivers the transmission and as the only Tecsun pl660 with its antenna on my balcony. Thanks for everything and I always wish you excellent listening. Frequency 5.895-9.890 to Wofferton, 7.360 to Ascension, not signal on 6.035 to Dhabayya. Nice Signal to Wofferton +20/30 db and S 9 to Ascension. Listenined yesterday (21 June 2018) at 21.30 UTC from Malta 5985 kHz SINPO 53553 using a Tecsun PL-660 and a longwire antenna 27 metres. Wonderful programme and good job. 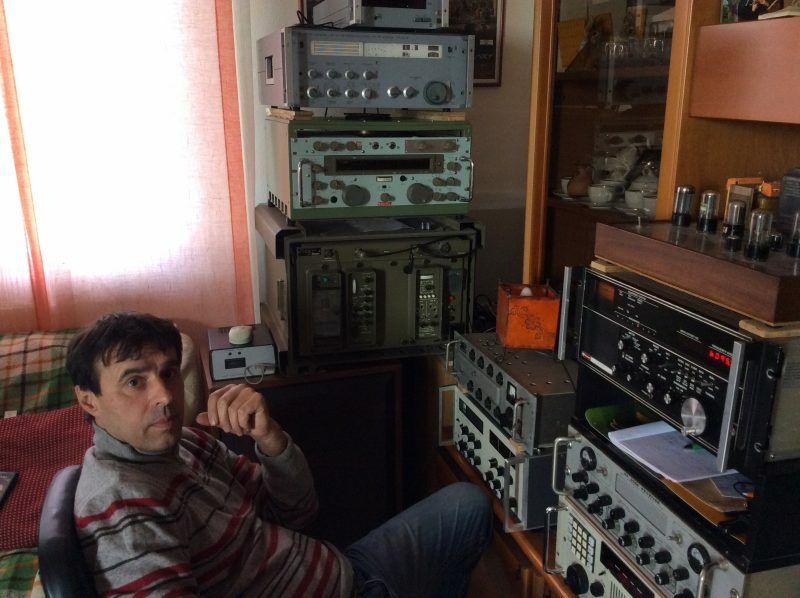 Receiver location: Romania. I used an Airspy HF+ SDR and a Wellbrook ALA100LN antenna (20m delta loop). QRM levels at my QTH were noticeably higher this year than last, continuing a years long trend in my area. Woofferton is only 100 miles from Basingstoke in Hampshire, and while it doesn’t lie in the direction of the transmission, the signal was strong and steady, overwhelming almost all of the interference. 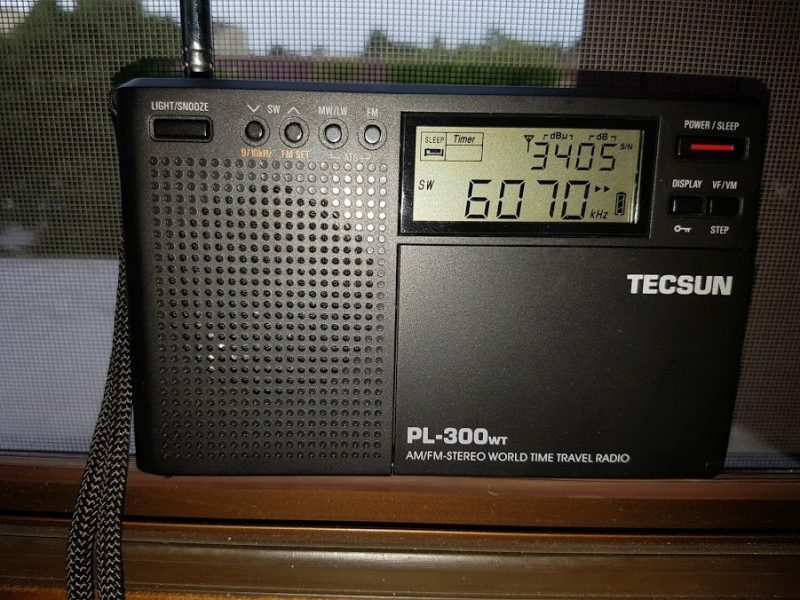 Three 1-minute clips of the BBC World Service Antarctic Midwinter Broadcast on 5985kHz, 7360kHz, and 9890kHz, recorded on a Tecsun PL-380 in north west London at 2230 (2130 UTC) on 21 June 2018. Click here to listen via SoundCloud. All three signals were good at my location in Ayrshire, Scotland. The best of the two Wooferton signals was 5985 AM. Here is a youtube video of my reception of the signal from Ascension Island on 7360 AM. Ant = End fed Wire, 20 meters long and ATU. BBC Antarctic Midwinter Broadcast 5985kHz Woofferton 2130-2200UTC 21/06/2018. Captured in Scotland using SDRuno/RSP2 and homebrew passive Mag Loop. I obtained decent recordings of the BAS broadcast both here in NB on 7360 kHz using a Tecsun PL-880 receiver with a Tecsun AN-03L 7-metre wire antenna strung to a nearby tree and using the U. Twente SDR receiver on 5985 kHz. Attached are two two-minute clips, one from the start of each recording. Also attached [above] is a photo of the “listening post” at the back of my yard. Note the mosquito spray! This year’s Midwinter Antarctic broadcast from the BBC was a special opportunity for me. I thought I would share the story because it has something to say about the state of technology in today’s world of radio. On the day of the broadcast, June 21, 2018 I was on a business trip to New York City. 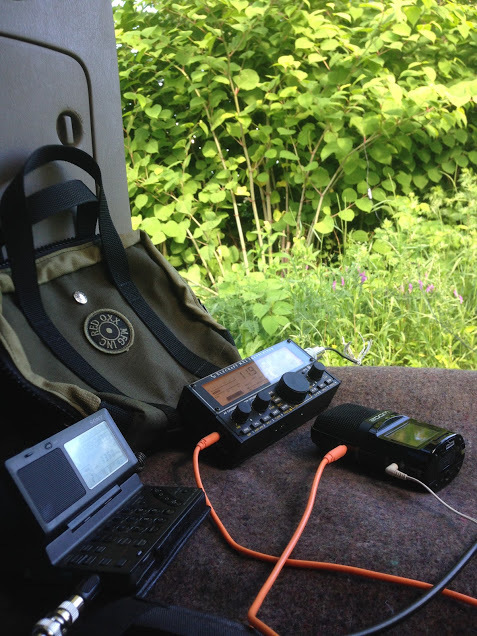 I had brought with me three very useful and very portable items: an SDRPlay receiver, a W6LVP portable amplified loop and an Eton Satellit shortwave radio. I created a youtube video with the four modes of reception above. it is amazing how connected the world has become! Click here to view via YouTube. I was able to get 2 different videos of the BBC Antarctic Midwinter Broadcast. One video is of the broadcast coming through an KiwiSDR channel and another is a recording of BBC through my Tecsun PL-380. Vee antenna. 9890 was very good, 7360 was good, while 5985 was poor. I got good copy on 9890 here in Smithville, NJ (5 miles north of Atlantic City). Readable copy on 7360 and almost readable copy on 5850. Used a combination of Tecsun Radios: PL-310et, PL-880, and S-8800. Used the telescoping antenna and a long wire antenna strung up in the house. Was surprised at how good the copy was on 9890. I managed to listen to a bit of the broadcast myself in the parking lot of the US Space and Rocket Center in Huntsville, Alabama. I only brought my C. Crane CC Skywave SSB along. The signal was quite weak, but I did log the 9,890 kHz broadcast from Woofferton, UK. Pretty impressive considering the modest portable receiver and the fact the broadcast’s target was Antarctica! Pure shortwave magic. My recording of 9890 kHz in Pennsylvania was much weaker. Just awful reception here in Northern California suburbia near three in the afternoon. I can just make out “Jingle Bells.” BBC Woofferton has been coming in well here from 04:00 – 06:00 UTC on 9915 kHz on some nights. 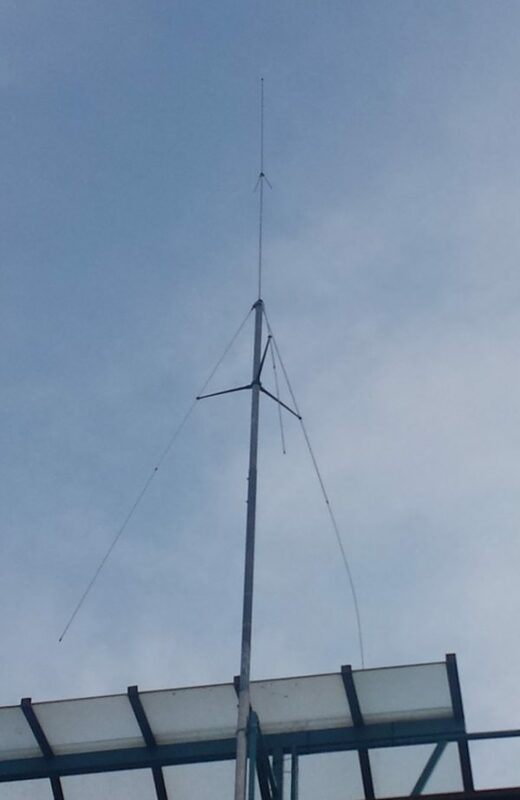 From Ovalle, Dipole Antenna and Tecsun PL 660. The start of the broadcast on 7360 kHz heard here in Marahau, Tasman Bay, New Zealand. Elad FDM-DUOr receiver & Wellbrook loop antenna. Once again, many thanks to all of you who submitted your recordings of the BBC Midwinter Broadcast! We’ll be sharing this post with both the British Antarctic Survey and the BBC World Service. And to all of you, from the SWLing Post: Happy (Belated) Midwinter! Happy Summer/Winter Solstice! This entry was posted in Broadcasters, Current Events, International Broadcasting, News, Recordings, Shortwave Radio, SWLers and tagged 2018 Antarctic BBC Midwinter Broadcast, Antarctic Midwinter Broadcast, Antarctic Midwinter Broadcast Recordings, Antarctica, BAS, BBC, BBC World Service, British Antarctic Survey Team, Recordings on June 26, 2018 by Thomas. Once again, SWLing Post readers did an amazing job of capturing off-air clips of the BBC Midwinter broadcast to Antarctica! Thank you so much for submitting your recordings! I hope to have a formatted post with all reader recordings published next week. It’ll actually take me a few dedicated hours to put it all together, so I appreciate your patience. These are very busy days for me, so if you’ve contacted me via email, I apologize for taking so long to reply. So far in the month of June, I’ve only been home perhaps a total of three nights. July will be equally as busy, plus I’ll also present at the Circle of HOPE 2018 conference in NYC. Really looking forward to that! 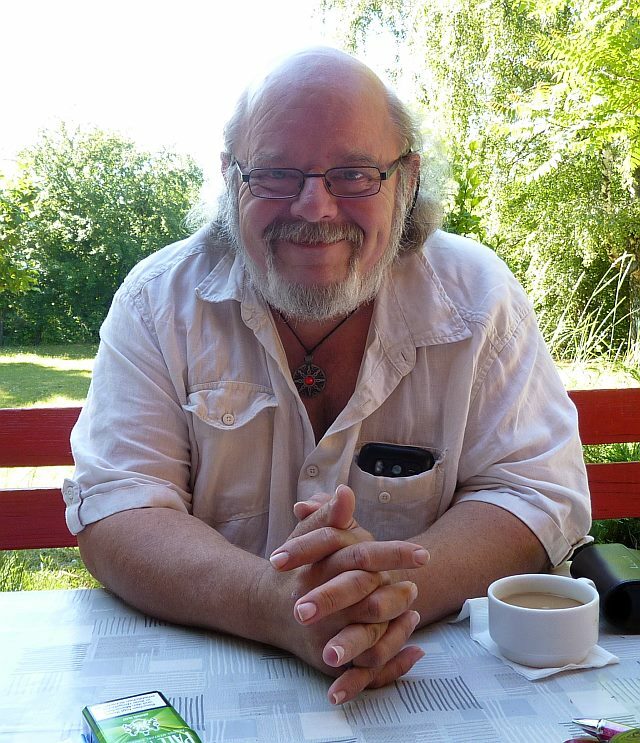 If you missed the Midwinter broadcast, Richard Langley has already posted recordings on the Shortwave Radio Audio Archive [thanks, Richard!]. Again, thank you all for such an amazing job! I’m looking forward to going through the recordings! 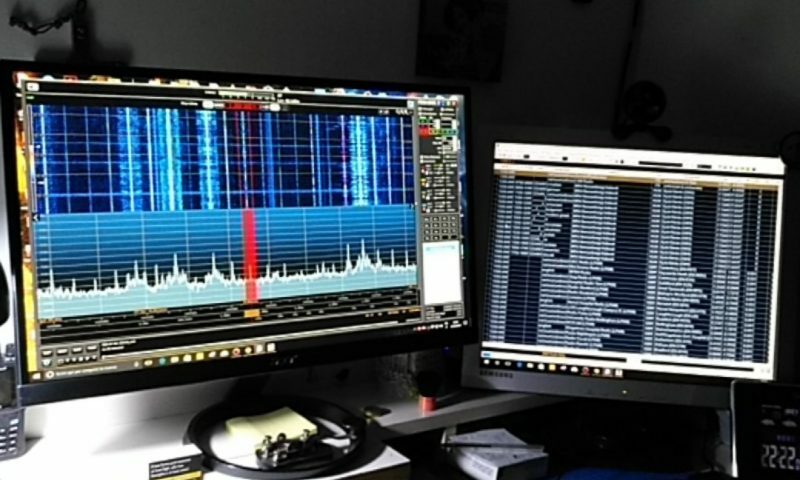 This entry was posted in News, Recordings, Shortwave Radio and tagged Antarctic Midwinter Broadcast on June 23, 2018 by Thomas. Every year, the BBC broadcasts a special program to the scientists and support staff in the British Antarctic Survey Team. 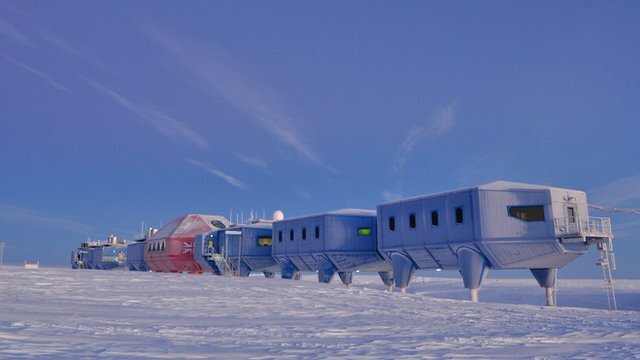 The BBC plays music requests and sends special messages to the small team of 40+ located at various Antarctic research stations. Each year, the thirty minute show is guaranteed to be quirky, nostalgic, and certainly a DX-worthy catch! After successful listener events from years past, I’m calling on all SWLing Post readers and shortwave radio listeners to make a short recording (say, 30-60 seconds) of the BBC Antarctic Midwinter Broadcast today and share it here at the Post (frequencies and time below). The recording can be audio-only, or even a video taken from any recording device or smart phone. It would be helpful to have a description and/or photo of your listening environment and location, if possible. Audio should be in the MP3 format and videos either hosted on YouTube or Vimeo so that I can easily embed them without having to convert and upload myself. If you submit your recording to me, I will post it here on the SWLing Post–and insure that the British Antarctic Survey receives the post, too. The recordings will be arranged by geographic location. This year, there have been few details about the broadcast announced in advance–I’ve seen no test broadcast announcements as in years past–so my fingers are crossed that it’ll take place on the air, on schedule. I’m sure there will be live reports in the SWLing Post chat room during the broadcast. Please sign in and share your report as well! 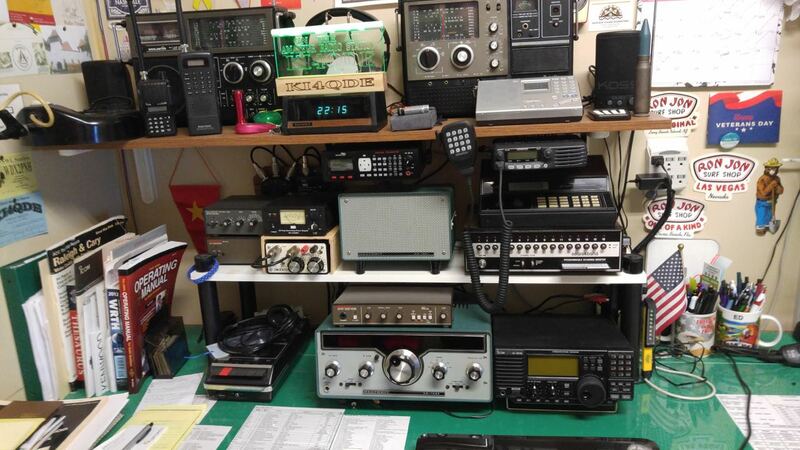 I hope I’ll be able to receive the broadcast this year–I’m traveling again, but will have a receiver in tow. Worse case, I’ll snag the broadcast from a WebSDR in Europe (which is a pretty easy catch). The Midwinter broadcast is one of my favorite programs of the year. I suppose, in part, this is because it happens on June 21–the Summer/Winter solstice–which also happens to be my birthday! Woo hoo! This entry was posted in Current Events, News, Shortwave Radio and tagged Antarctic Midwinter Broadcast, Antarctic Midwinter Broadcast Recordings, Antarctica, BAS, British Antarctic Survey Team on June 21, 2018 by Thomas. Listening for the Midwinter test transmissions last week with the Elecraft KX2. This entry was posted in News, Schedules and Frequencies, Shortwave Radio and tagged Antarctic Midwinter Broadcast, Antarctic Midwinter Broadcast Recordings, Antarctica, BAS, British Antarctic Survey Team on June 17, 2018 by Thomas. On Wednesday, 21 June 2017, the BBC World Service officially transmitted the 2017 BBC Antarctic Midwinter Broadcast–an international radio broadcast intended for a small group of scientists, technicians, and support staff who work for the British Antarctic Survey. Below are the entries, roughly organized by continent and country/region, including reader’s photos if provided. If I’ve somehow missed including your entry, please contact me; I’ll amend this post. Notes: Here is a short recording of BBC AMB on 5985kHz. It was recorded using the IC 7300’s internal record function. Antenna used was a dipole for 7MHz. Notes: Very strong on 5985 kHz. Weaker on 7360 kHz. Notes: Attached please find the link to my reception Video of the 2017 Midwinter broadcast. and a photo. Just failed the first seconds, because I’ve muted my headphones and was wondering why I couldn’t hear anything. Hihi. For the reception, I used my good, old Kenwood R1000 and my homebrewed mag-loop. Recorded via soundcard and processed with Audacity. The Video later on is done with the NCH VideoPad Software. Notes: 2017 BBC Antarctic Midwinter Broadcast being received on my Tecsun PL-660 whilst in Ruhpolding, Germany. Antenna was just the supplied wire hanging vertically from the window. Wasn’t expecting much due to the surrounding hills but was pleased to pick up the Ascension transmitter. 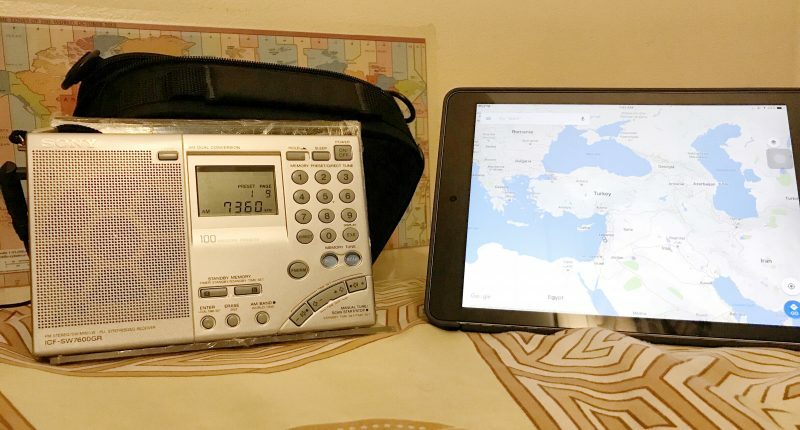 Notes: This is my recording of the midwinter Antarctic broadcast, recorded in Puglia (Southern Italy) with Tecsun PL-660 with Its whip antenna. Notes: Even this year I had the pleasure of listening the BBC ANTARCTIC MIDWINTER BROADCAST TRANSMISSION and I send you the listening report. 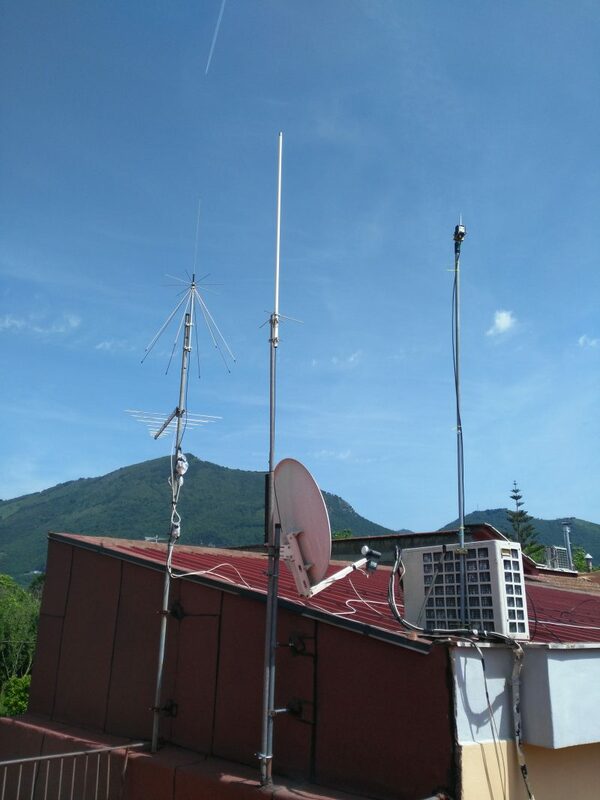 I attach the recording of the first minute of the transmission received and also pictures of my receiver (during reception) and my antenna. Unfortunately the first 20 seconds of recording are disturbed by noise due to an error in connection between receiver and recorder. Notes: Receiver: JRC NRD 345. Frequency: 5985 KHz AM very strong signal s9+30 perfect reception! Notes: I used the Tecsun PL-660 with its telescopic antenna and only on Dhabbayya frequency 6035 I had a bit of difficulty. I’m on my home balcony in Formia, Center Italy, Tyrrenian sea. Click here to. view on Vimeo. Notes: I used an AOR 1500 with a long wire antenna (about 40 meters). My QTH locator is JN55XI and best frequency was 5985 kHz. 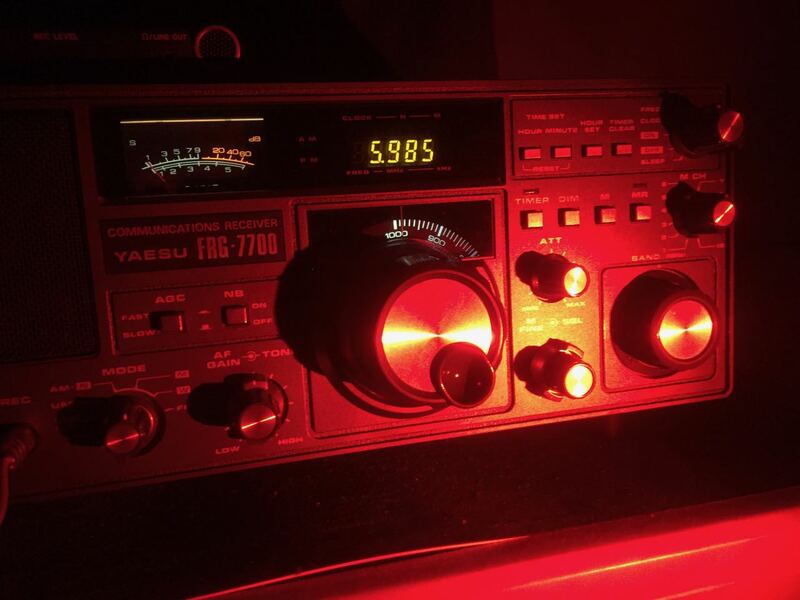 There was light overlap by an RTTY station but reception was loud and clear. Other frequencies were bad, too much fading or unreadable. Davide Borroni at his listening post. 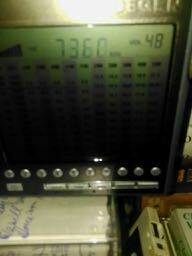 Notes: I listened BBC Midwinter with SINPO 34333 on 6035 kHz AM Thanks for show ! 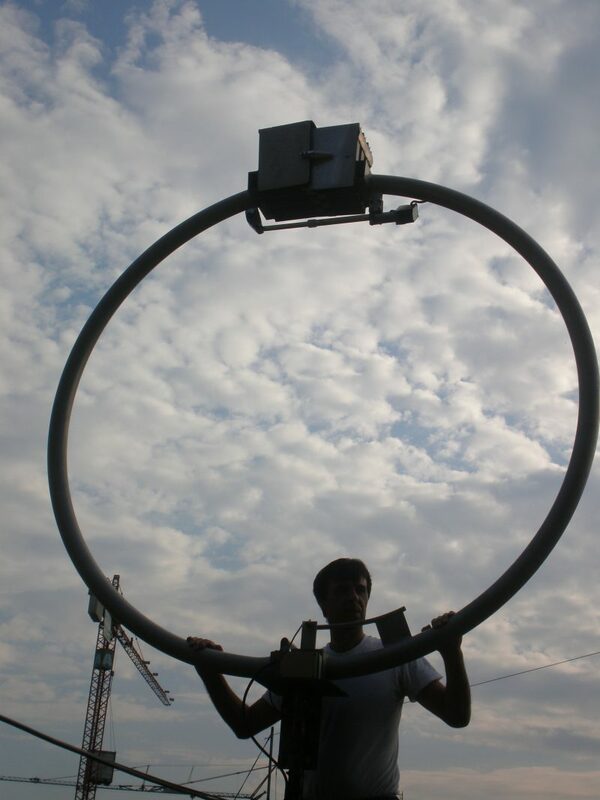 Davide with his Siemens E401 magnetic loop antenna. I was curious to listen this transmission and Wednesday I tried to receive it with a little Tecsun PL-300wt and its antenna. My QTH is impossible for electric noise (I live in a flat on a bank with alarm, neon, and so on) but I listened the transmission on 6035 khz SINPO 24131 (quite inaudible), on 7360 kHz SINPO 34232 so I’ve listen on 5985 kHz SINPO 44333 (in record attached with ID), I’ve listen transmission from 21:30 to 21:50. Reception setup: Receiver JRC NRD 545 Dsp, JRC NRD 91, Watkins & Johnson 8718-9, Elad FDM S-2. Antenna: Wellbrook Loop ALA 1530 Lf. Reception not possible on 7.230 !! Very big interference from China Radio International. Listened from Malta to the BBC tests, of the four frequencies two were good. 7360 kHz SINPO 54554-53553 and 5985 kHz SINPO 54554. The other two SINPO 33333 using a Degen DE1103 with a longwire antenna 27 meters long at 23.30-23.45 CET . Sending also photo and recording . Notes: Reception area: Belgorod city, Russia. Receiver: Tecsun PL-680. 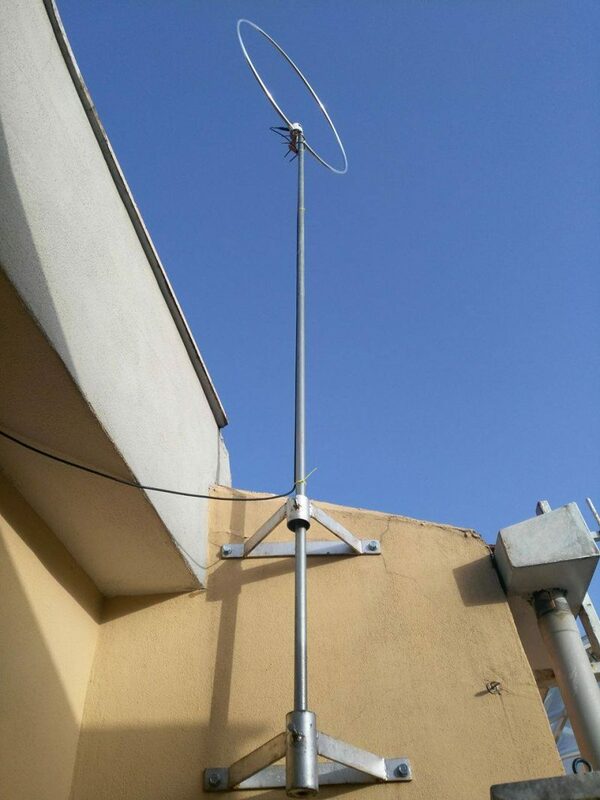 Antenna: long wire – 12 met. Notes: BBC World Service Antarctic Midwinter Broadcast 2017. Cerys Matthews (Catatonia) presents music requests and special messages to the staff at the British Antarctic Survey, broadcasting in English, June 21 2017, 2130-2200 GMT on 5985 kHz (transmitter power of 300kW, transmitter location: Woofferton, UK). Recorded with an SDRPlay RSP2 using SDRuno and a homebrew passive Mag Loop. Tonight I rushed home from work in time to hear the broadcast. Signals were good at my QTH in Scotland, even though we had thunder storms to the East of Scotland. I made several (shaky) videos on my smart phone. As you will see from the videos, my receivers are more of the classic/old type, but reception was good with my home made antennas. Details of my receivers, antennas and location are on the youtube videos. reception from Ascension on 7360 kHz AM. I also heard Dhabayya with a good readable signal, but the first two were the best signals best with me. Notes: Please find enclosed a short extract from yesterday’s broadcast, plus a picture of the radio used just before the programme started. Again it was so interesting to hear a broadcast aimed to such a small audience with heartfelt messages from their friends and family. I had good luck with recording the BAS broadcast both here and using the U. Twente receiver. Attached are two two-minute clips, one from the start of each recording. Also attached [above] is a photo of the “listening post” at the back of my yard. You can hear my full half-hour recordings on the Shortwave Radio Audio Archive. The Sony ICF-SW100 which I hooked up to my portable PK Loop mag loop antenna. 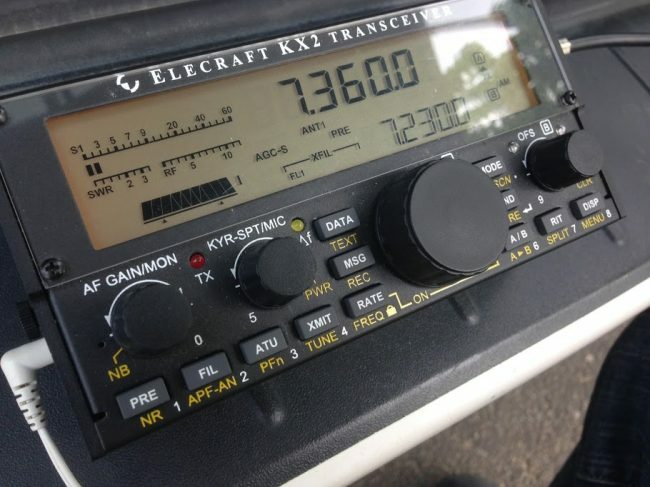 The Elecraft KX2 which I hooked up to a NASA PA 30 multi-band compact wire antenna that I suspended in a tree. 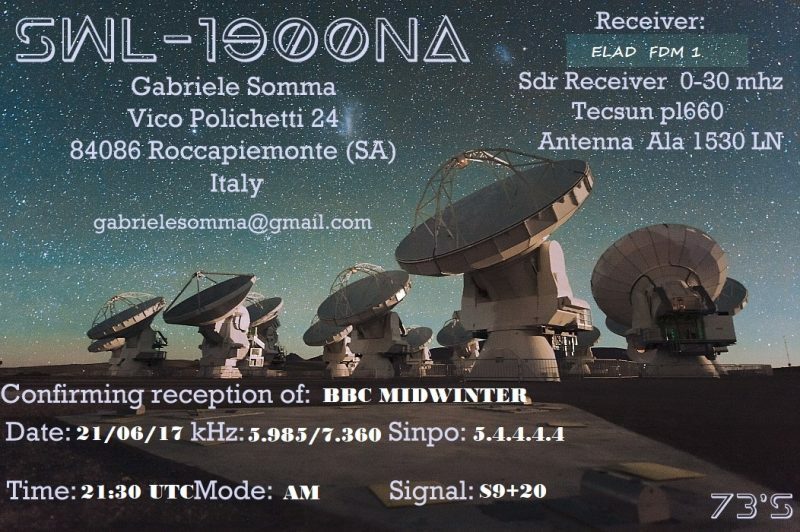 None of the frequencies used for the Midwinter broadcast were ideal for my location and time of day (after all, these broadcasts target Antarctica!) but last year I did successfully receive the 41 meter band broadcast. The KX2/NASA PA 30 provided the best reception results, but sadly the recording turned out quite poor due to an incorrect setting on my Zoom H2N digital recorder. Read my full Midwinter report from the field by clicking here. Notes: Attached are 2 audio clips of the broadcast. Both on 7360 from Ascension. I could not hear anything on the other frequencies. Notes: I listened to the signal on 7360 kHz from the back porch of my home in Bowling Green, KY. 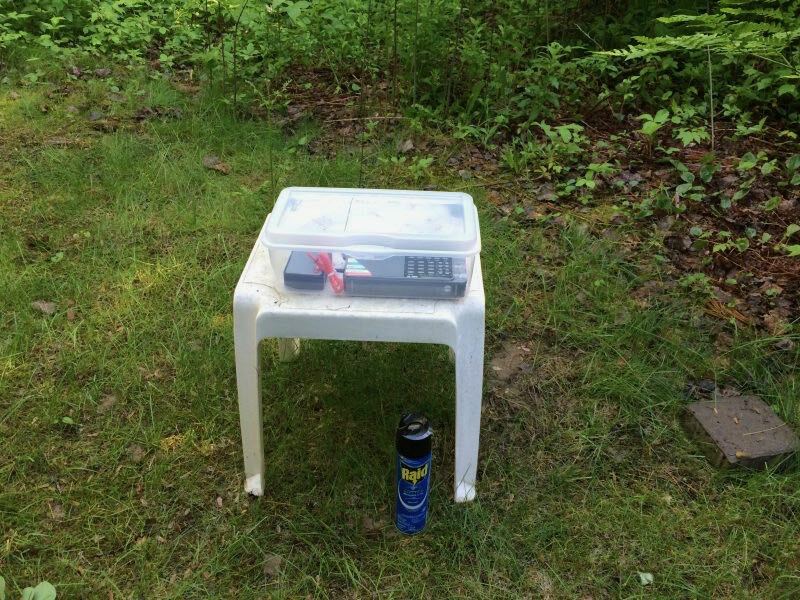 I used a 35′ end-fed external antenna located about 20′ up in a tree. I received a similar quality signal using the external antenna with a Kaito 1103 radio. I also received the signal on the Kaito using only its whip, although the signal was substantially weaker. Thank you for your excellent work on the SWLing Post. Notes: My first attempt at catching the Midwinter broadcast; I wasn’t expecting to pick up anything at all, but the Ascension Island location came through well enough that I could positively identify it when I compared to BBC’s recorded broadcast. Recording of my reception (the beginning of the recording corresponds approximately to the 4:00 mark in the BBC recording below). Location was western Michigan in the U.S.
Click here to listen via Clyp. 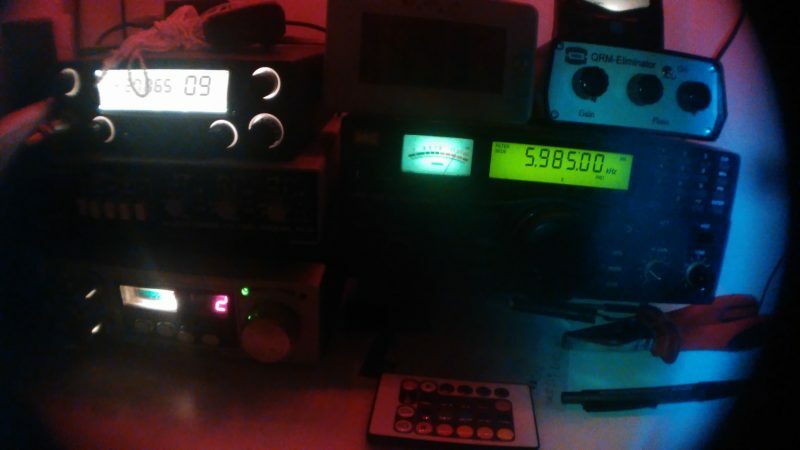 Notes: I’m sending you the first seconds of the BBC Antarctic Midwinter Broadcast, using a Yaesu FT 840 and a half wave dipole, 30 Km south from Buenos Aires. It is on 7360 Khz. It had good signal, but too much noise here. We’ll be sharing this post with both the British Antarctic Survey and the BBC World Service. And to all of you, from the SWLing Post: Happy Midwinter! Happy Summer/Winter Solstice! This entry was posted in Broadcasters, International Broadcasting, News, Recordings, Shortwave Radio, Videos and tagged 2017 Antarctic BBC Midwinter Broadcast, Antarctic Midwinter Broadcast, Antarctic Midwinter Broadcast Recordings, Antarctica, BAS, BBC, BBC World Service, British Antarctic Survey Team, Recordings on June 28, 2017 by Thomas.